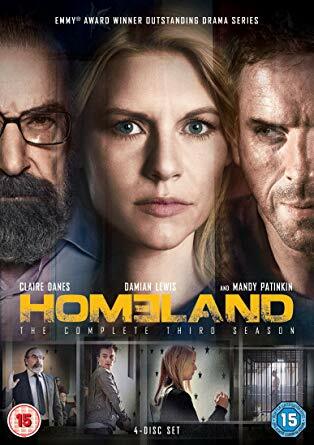 It's been some time since we had watched the first two season of Homeland and for one reason or another we had tapered off watching during the third season. And it's not like the show was terrible enough to merit stopping but it can be a little tiring since it tends to weave narratives that rely on a lot of tension keeping you on edge over the course of the season. This third season of Homeland felt like an odd little duck since we really threw some of the characters into very strange situations only to have things come together for a rather unusual climatic turn of events. I guess it sort of makes sense as a setup for the season that follows it but on its own the story ends up being a little odd. Or maybe I'm getting a little tired of some of the drama that keeps happening over and over again. Sure it shows consistency in these matters in terms of how they respond to bad situations but at the same time it's also a little lazy. We can do better. Synopsis: Homeland is an American spy thriller series developed for Showtime by Howard Gordon and Alex Gansa. The series is loosely based on the Israeli series Prisoners of War that had been created by Gideon Raff. The season begins with everyone dealing with the fallout of the explosive climax of the last season. Carrie (Claire Danes) and Saul (Mandy Patinkin) have been asked to testify before Congress as they investigate the circumstances of the bombing. Dana (Morgan Saylor) is getting released from the hospital following her suicide attempt in a strong rejection of being the daughter of a terrorist sleeper agent or whatever reason. But more and more it feels like Carrie is being hung out to dry with Congress and Saul becomes less and less visibly supportive of her. This leads to a rather striking downward spiral as its clear that pressure is being applied to make her scapegoat of sorts of the bombing with very few others in the agency willing to stand by her. And Brody (Damian Lewis) is still alive but very far away from home. What I Liked: The initial arc with Carrie going through one hoop after another as the Congressional investigation (or perhaps witch hunt) continued started out a little rough but really had a great payoff once things came together. It's this kind of complex narrative planning when the show truly shines and creates some great memorable television moments. So yes, I super loved how that resolved because it was a twist that may not have been totally surprising but it was definitely earned fully given all that had happened. Saul's character arc is also a rather complex one that is woven into the fabric of the entire season. He's a man doing his best to hold things together on multiple fronts but he's also not charismatic enough to have more widespread support. And he has to deal with the fact that his role is not strictly one based on merit but one that also has a political aspect to balance. What Could Have Been Better: I feel rather bad for Damian Lewis in this season since for the most part it felt like they didn't quite know how to write for his character and for his family. Dana had a decent narrative arc but it didn't exactly have a great conclusion to it. Jessica (Morena Baccarin) really hasn't had much to do in recent seasons other than get upset over her situation or resign herself to be helpless in the face of her family being all weird. And then Carrie is still Carrie is still Carrie and I still go back and forth in my head when it comes to whether or not I really feel that the fact that I find her portrayal so annoying speaks to Claire Danes' skill in bringing the character to life or it's just a bad thing overall. She continues to make terrible decisions and it becomes very easy to accept that she really does have legitimate mental health concerns that should probably result in her getting fired as an agent because she's way too much of a risk. TL;DR: I'm not sure where Homeland is going to go beyond this point since this season sets up a new status quo beyond it, but it does get a lot of great things done within its 12 episodes. The characters don't always develop but the story certainly does and this larger narrative arc has a lot going for it. Thus the season gets a good 3.5 accusations that come out during the Congressional hearings out of a possible 5.